Mynard, J. (2015). Editorial. Studies in Self-Access Learning, 7(1), 1-3. Welcome to issue 7(1) of SiSAL Journal, which is a general issue. It contains three full papers, a work in progress, two reviews edited by Hisako Yamashita, and three papers that form the fourth part of the language learning spaces column edited by Katherine Thornton. The first paper by Sahar Alzahrani and Julie Watson from the University of Southampton in the UK explores the link between strategy training and autonomous learning through a research project conducted with medical students in Saudi Arabia. The focus of the paper is on students’ attitudes, awareness, and use of language learning strategies which were investigated using written reflections, interviews and focus group discussions. The researchers found positive results in the students who had received strategy training, particularly those who received online training. The second paper by Neil Curry and Satoko Watkins based in Japan provides an outline of a peer mentoring programme at the authors’ university. The paper outlines the context and rationale for the programme and introduces the approach to recruiting and training the mentors. The authors also give due consideration to kind of research that will take place in the coming years. The third paper by James Simmonds based in Mexico is also concerned with learning that is facilitated by a peer relationship. The author describes a small research project that investigates the effectiveness of student-run workshops. The author draws on interview data investigating student experiences with the workshops and peer interactions. The findings indicate the value such workshops and peer interactions have on learning as they break down hierarchical relationships in traditional learning environments and boost confidence in learners. Kwan-yee Sarah Ng and Yang Gu based at the Chinese University of Hong Kong (Shenzhen), describe the trial operation of the Self-access Language Learning Centre and explore students’ needs and preferences in self-access English language learning. The authors describe and evaluate the operation and then go on to discuss recommendations for how the SALL might develop in the future. There are two reviews in this issue which were edited by Hisako Yamashita, our reviews editor. The first is a book review by Marilyn Lewis who is based in New Zealand. Lewis reviews a book published by Palgrave McMillan in 2015: Assessment and Autonomy in Language Learning Edited by Carol J. Everhard and Linda Murphy. The review summarises each chapter and comments on the cohesive nature of the book despite the diversity of contributions. 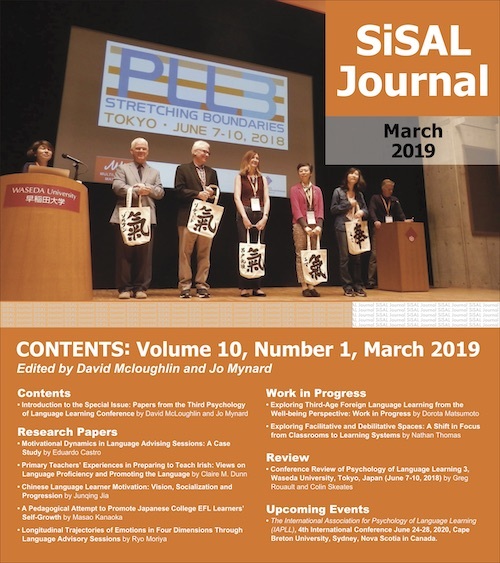 The second review published in this issue of SiSAL Journal is of an event in Japan. Andrew Tweed reviews the JASAL (Japanese Association of Self-Access Learning) 10th Anniversary Conference which was held in Tokyo in December 2015. The review briefly summarises each of the 12 presentations at the event, exploring them within four themes: integrating self-access and curriculum; learning spaces; activities and events; and focus on individuals. The theme of the newest instalment of the Language Learning Spaces: Self-Access in Action column edited by Katherine Thornton is the development of learner autonomy through initiatives within learning spaces. In her introductory article, Katherine Thornton summarises the three contributions in this issue which come from Kerstin Dofs and Moira Hobbs based in New Zealand who discuss online courses; Tarik Uzun, Hatice Karaaslan and Mümin Şen who are based in Turkey and are in the process of developing a language advising programme; and Andrew Tweed who reports on an initiative to develop a language advising programme in Cambodia.